Baking gingersnaps is a Christmas family tradition at the Smith house. My dad was diagnosed with heart disease when I was in university and it was one of my missions to create heart healthy foods for him. When I discovered canola oil I switched the original gingersnap recipe that contained shortening to heart healthy canola oil and as a result dad got his favourite cookies every Christmas. In a large mixing bowl using electric beaters, beat together canola oil and sugar. Add molasses and egg. Beat until fluffy. Stir in whole wheat, baking soda, baking powder, cinnamon, ginger and candied ginger until the dough comes together. Place sanding sugar into a shallow bowl. Scoop out teaspoonfuls of the dough, roll into a ball and lightly press into the sanding sugar to slightly flatten. Flip over and place sugar side up onto the cookie sheet. Bake for 12-15 minutes or until golden brown. Let cool on cookie sheet for 1 minute, remove from parchment paper and let cool on cookie sheet. 2 cookies contain: 160 Calories, 7 g Total Fat, 0.5 g Sat Fat, 0 g Trans Fat, 90 mg Sodium, 25 g Carbs, 1 g Fibre, 2 g Protein. If you are chocolate lover, omit the sanding sugar, chop up ¼ cup (60 mL) dark chocolate and set aside. Scoop out the dough and form it into a ball, then slightly flatten it using the heel of your hand right onto the prepared cookie sheet. Bake as per the directions above. 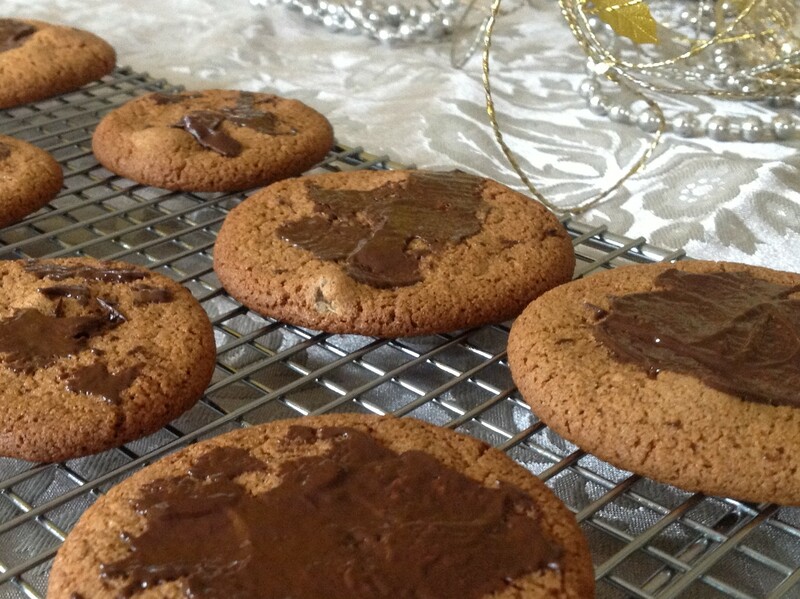 When the cookies come out of the oven, sprinkle a small amount of the chopped chocolate on top of each cookie. Let the chocolate melt and then spread out with a knife. Let cool for 1 minute, remove from cookie sheet and place on a wire cooling rack. Let the chocolate set and then store in an airtight container for up to one week, or freeze for up to one month. Would these Gingersnaps be okay for a diabetic? Love that you love the chocolate chip cookie recipe – its a house recipe! 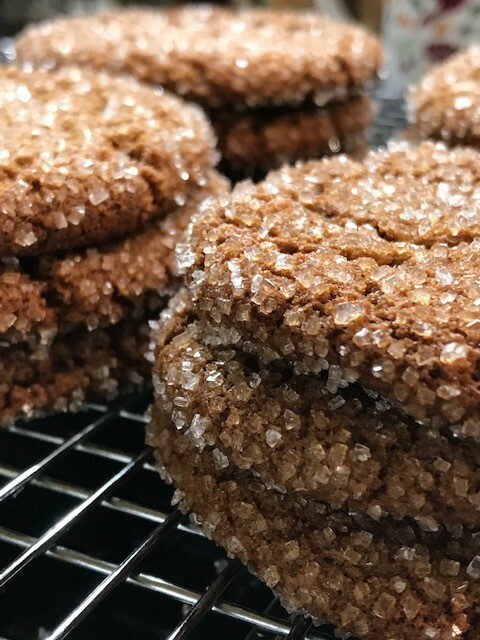 For the Gingersnaps – You’ll have to check the sugars and the carbs in the recipe for a person living with diabetes, but I am fairly sure that someone could make them a part of their eating plan. Great segment you had show on BT this morning. The set and you with your Santa hat was terrific… getting into the Christmas spirit. Just want to double check about adding another ingredient to the Ginger Snaps. Was that flax seed you were adding ? If so how much ? Just ate one of my cookies and they are really great! is that going to work out the same, when that only adds up to 1 cup…versus 1 3/4…. Also, could almond flour be substituted for either? And what about shortbread? Can any of those gluten free flours be substituted for regular flour? Sorry this is such a late answer. I don’t bake much gluten free so I’m sorry this will be a guess. I’d add 1 cup of the oat flour. and almond flour? No clue…sorry! Mairlyn : can these be modified to gluten free status? HOw? do they have a nice snap when eaten? Yes they can. I use 3/4’s oat flour and 1/4 quinoa flour instead of the whole wheat. I don’t see any info about number of grams of sugar in the nutritional info. Is it possible to get that, please? Thank you.